Updated January 16: The Metrolinx board has agreed to publish the Benefits Case Analysis for the SRT replacement project. As I write this, they don’t have a working website, but once the report is available, I will review it here. 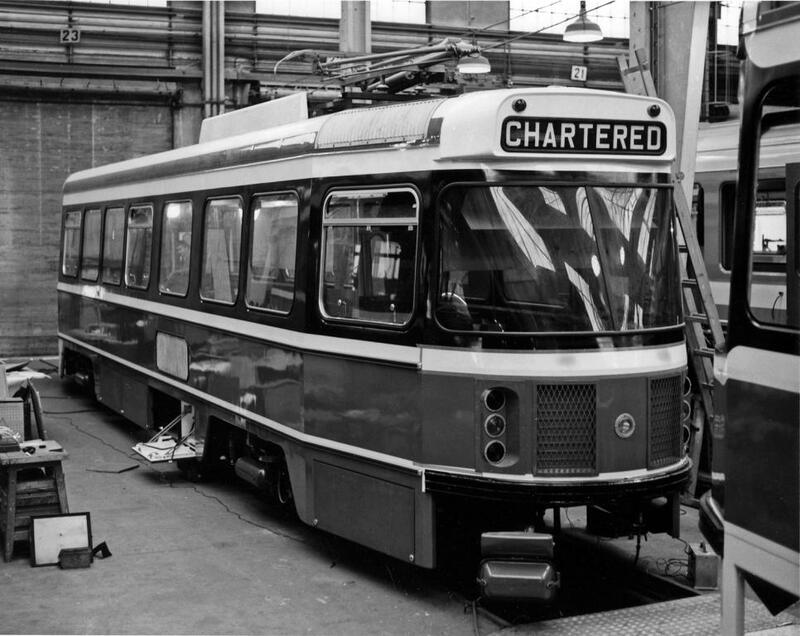 Updated January 11: John F. Bromley has kindly supplied photos of CLRVs 4000 and 4001 showing the cars with pantographs. My archives yield up interesting goodies from time to time. In anticipation of the Benefits Case Analysis report at Metrolinx for the SRT replacement and extension project, I thought it worthwhile to revisit the original Scarborough LRT. Here’s Progress Report No. 1. Yes, it’s a streetcar! That was the original plan, and the line was built for CLRVs. That’s why there is a streetcar-radius curve at Kennedy, and if you look closely, the remnants of clearance markers on the original low platform at track level. When the station opened, even though it was RT by then, the graphic over the up escalator was a streetcar. Note the design for the station at STC where the streetcars are at the same level as the buses. It didn’t take long for someone to hoodwink Scarborough Council into thinking that this simply would not do, and the streetcars needed their own level lest they isolate the land south of the station from development. Anyone who knows the site knows that the bus roadway does quite a good job of that. By Progress Report No. 2, which is otherwise quite similar to No. 1, the design has changed to an elevated structure. Moves were already afoot to substitute RT technology, but the streetcar line took the political hit for imposing an elevated on Scarborough’s new Town Centre. In time, the RT technology replaced the LRT scheme. A few things worth noting here are that the estimated cost has gone from $108.7-million in the LRT plan to $181-million in the RT plan. The final cost would actually be in excess of $220-million thanks to add-ons including extra cars. The CLRV fleet was planned to be 22, and the RT fleet we wound up with is 28. The RT promo also claims that because the wheels are not used for traction or braking, there will be lower vibration compared with conventional vehicles. In those days, the CLRVs were still running with the original Bochum wheels, and streetcar track construction guaranteed lots of corrugations and noise. The RT developed its own problems in time because those wheels do bounce, and they are also used for the final braking effort when they can (and do) slide producing flat spots. Now, almost 30 years later, we are finally looking at extending the RT further north. If this is done as LRT, it will be able to share a new carhouse and trackage with the Sheppard East LRT, and will also form the northern portion of the eventual Scarborough-Malvern line. When the Metrolinx analysis comes out next week, we will see whether the lure of expensive, unnecessary high technology still rules the decision, or whether we can start to undo the damage of building that orphan RT line so many years ago. 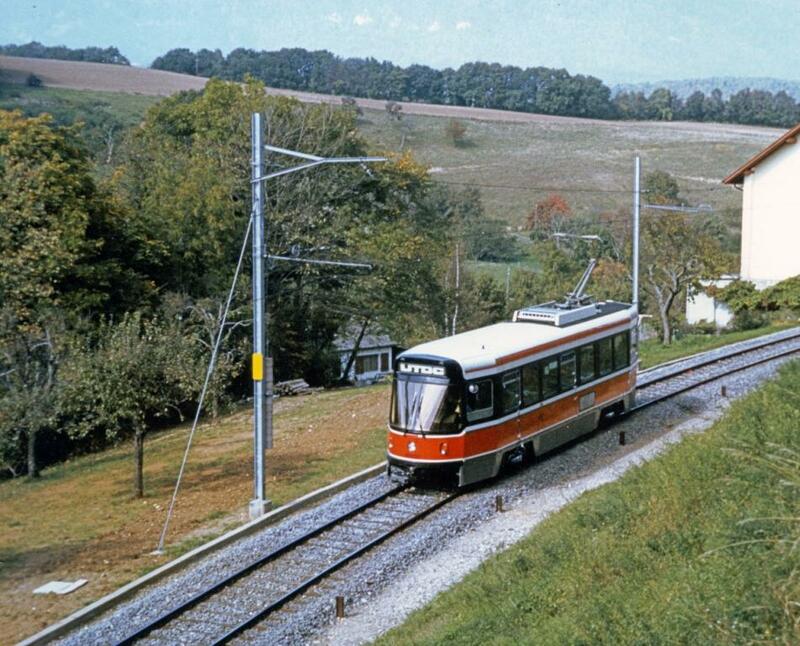 Update: Here is John F. Bromley’s photo of CLRV 4000 fitted with a pantograph at the SIG factory in Neuhausen, Switzerland on June 29, 1977. Here is a photo of 4001 leaving Orbe, Switzerland on the Orbe Charvonay Railway on October 6, 1977. This photo was taken by Ray Corley, and is provided by John F. Bromley. This entry was posted in Scarborough RT/LRT/Subway, Scarborough-Malvern LRT, Sheppard East LRT, Transit. Bookmark the permalink. And I bet that the Skytrain didn’t receive the multi million dollar retrofit to heat the power rails either. Due to Vancouver’s usually milder, gentler snows, they likely haven’t invested in our less hospitable clime’s necessity for a costly, only partial fix to this technology’s woeful inadequacies. SRT is slow, but it’s much, much better than the Spadina streetcar with its dedicated lanes. My fear is that the LRT is simply more Spadina-streetcar-like lines. Will patrons on this LRT pay to enter a station, and then enter at doors along the train (like subways), or do they have to single-file to the front and pay the driver? Steve: The Spadina line would be speedy like the SRT if it only stopped at Bloor, Queen and Queen’s Quay, with no waits for traffic lights or pesky things like passengers in between. All of the new Transit City lines as well as the basic TTC system will be converting to all door loading with Smart Card fare payment. The new cars do not have a door behind the driver where people could enter to drop money or tickets into a farebox. Now this is an oxymoron. This sounds like taking a step back in rapid transit development. This is exactly what American cities of the 50s and 60s did, converting rail operations to road operations. You can pretty much do the same thing with an LRT line. The potential ridership is there. Steve, were these Progress Report pamphlets aimed at the general public? I noticed that there are some technical terms in the brochure (“passengers/hour/direction”, “right-of-way”, “at-grade”, “grade-separated”, etc.) and was wondering if the public’s comprehension was compromised as a result. What was the public’s perception of streetcars at the time of the LRT proposal? It seems that LRT promoters were far less afraid of associating LRT with streetcars than they are today. Steve: Those were public handouts, and, yes streetcars had a much better reputation in those days before the TTC started to slash service in the city and forgot how to manage routes to maintain headways properly.